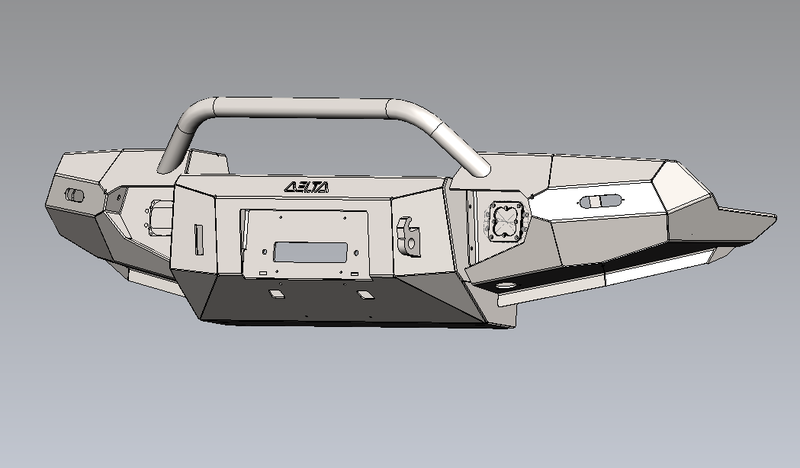 Back with the announcement of the Delta Vehicle Systems FJ80 and FZJ80 front bumpers. You may have seen the prototype of this bumper on our Overland Expo client build. We’ve made some improvements since then and are now ready to sell these things! Driven by the need for off-road clearance while maintaining strength and good looks, this bumper protects your vehicle and adds functionality. With a hidden winch tray, interchangeable light mount plates (Baja Designs, Rigid, and “cut your own” are current options), included LED turn signals, dual purpose shackle mounts with integrated “quick-hook”, and optional bull-bar, this bumper goes the extra 10 miles. 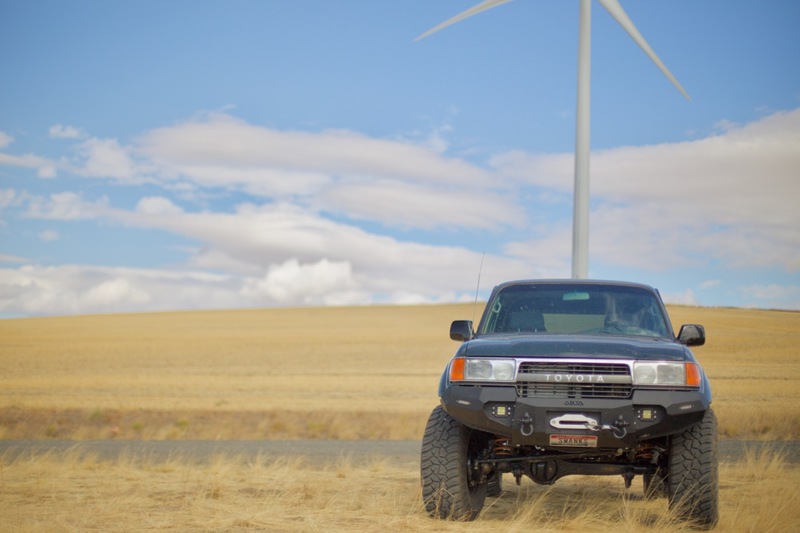 They are available with or without a bullbar, but the first run is all without. All the bumpers have two openings on the top surface so you can access your hidden winch with ease. Standard fairlead mount holes and license plate holes on the same spot in the front, with secondary plate mounting holes on the lower surface (note: may not be legal to mount the front plate on the lower surface in your state). The winch zone is designed to fit a WARN M8000 style winch. The prototype has a Smittybilt 10k winch installed with zero issues and plenty of room to spare. Note: the relays will need to be mounted under the hood for almost any winch. Another unique part is our “quick-hook” shackle mount. Not only do you have the standard two spots to mount shackles that are lined up with the frame for maximum strength, but you have two hooks incorporated into the same piece of metal that you can just throw a loop over for quick, non-critical situations. There is also a hidden mounting location for a NOCO 110V receptacle (this model: https://no.co/gcp1) for adding shore power/permanent trickle charger, block heater, etc. Since the 91-94 FJs have different grills/lights/valence than the 95-97, you will want to choose the appropriate option when you order. This selection matters because the bumper follows the grill closely and replaces the valence. With this bumper, you do NOT have to mess with your AC components on an FZJ. The bumper clears the bottle and the dryer can be left in place (it will hang below the lower edge of the bumper by about an inch). 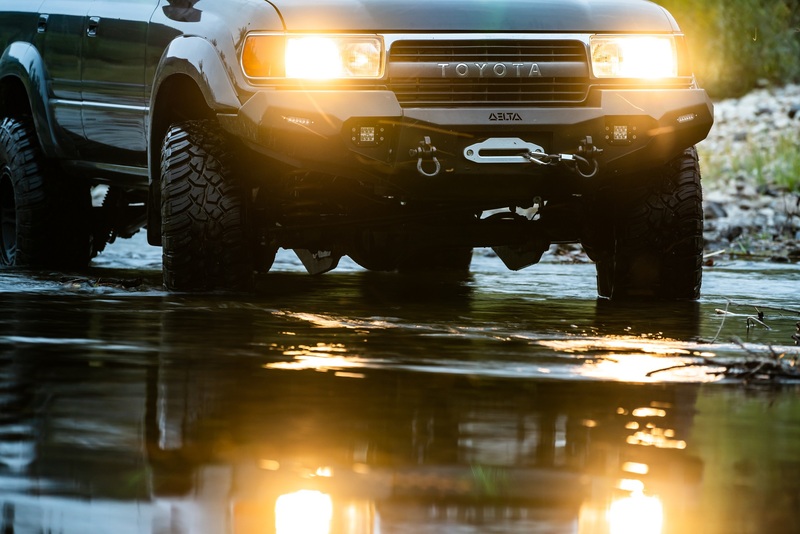 Our bumpers work equally well on flared and de-flared rigs. Flares drove the design, but the outside edge is driven by the curves of the body and looks just as great on de-flared rigs. Whichever setup you have, you will be getting plenty of protection via this bumper. We include a pack of stainless steel shims so you can get the bumper “just right” in case your rig has any kind of body/frame mis-alignment. All needed hardware to mount bumper is also included. The bumper is up on our site now (www.deltavs.com), ready for purchase and shipment. As usual with a bumper this size, freight shipment is required. You can save $70 if you have a forklift, and another $70 if you have a commercial address it can go to.